Alvionne will take over as Co-Chair in January and will shadow the co-chair role this term. Sophie will be the new Social Media Coordinator. 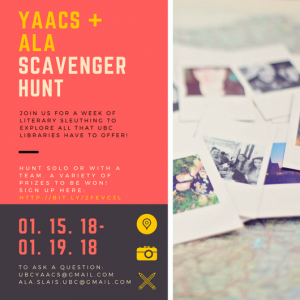 YAACS will partner with ALA for scavenger hunt again. Scavenger hunt will be on campus to give students a chance to get to know UBC & campus libraries. Will plan for January. Aim to have clues written by December. Erin & Lisa will make shared Google Doc with different categories (libraries and IKBLC) to create list of clues. Want to have variety of difficulties for clues, with different points and prize levels. Sophie offered to look at scavenger hunt she’d previously planned for ideas. Overall went well, but realized it might be hard for people to join events if we don’t have obvious way to identify that we’re ALA@UBC. Could have buttons to identify us (education library might have button maker). Sophie will look into setting up a virtual number so ALA@UBC can send text reminders to people instead of just using email. Button making! Will need button machine and materials. Plan for the end of October (maybe week of the 24th), not on a Wednesday. Erin & Lisa will create a Doodle poll this weekend to finalize time/date. Interest within ALA@UBC but want to gather interest from others. Make announcements in classes and invite people to an event to discuss it (same time as button-making). Will makes posts on social media to get people interested (Sophie will make an ALA@UBC facebook page). Possibility of subsidizing related fees (note: fees are $120 for ALA members, $125 starting in November). Not enough time to organize for this term. Postpone until end of next term and start planning process now. 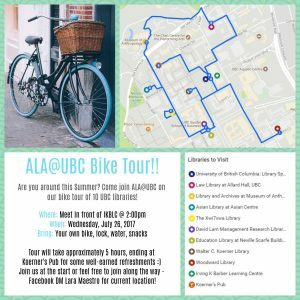 Should look into talking to a UBC librarian: maybe they can help with planning or suggest UBC library employees who could participate. Erin & Lisa will talk to Richard. ALA@UBC will create a shared Google Doc to gather advice for students (similar to course doc on SLAIS Social Page). Will have a Q&A section. Erin & Lisa will get new Exec members access to ALA Google Drive. Will decide by Doodle poll. The ALA@UBC is an accredited ALA Student Club, which serves to broaden the recognition of ALA membership and the advantages of said membership. The dissolution of the CLA in 2016 has emphasized the importance of the ALA.
Benefits of ALA membership include scholarships (usually within the first ¾ of your degree), monthly professional emails, round table memberships, log-in resources, online courses, streamable webinars, etc. There are executive membership positions and co-positions available. The ALA@UBC would like to have a Social Media Coordinator for Twitter. 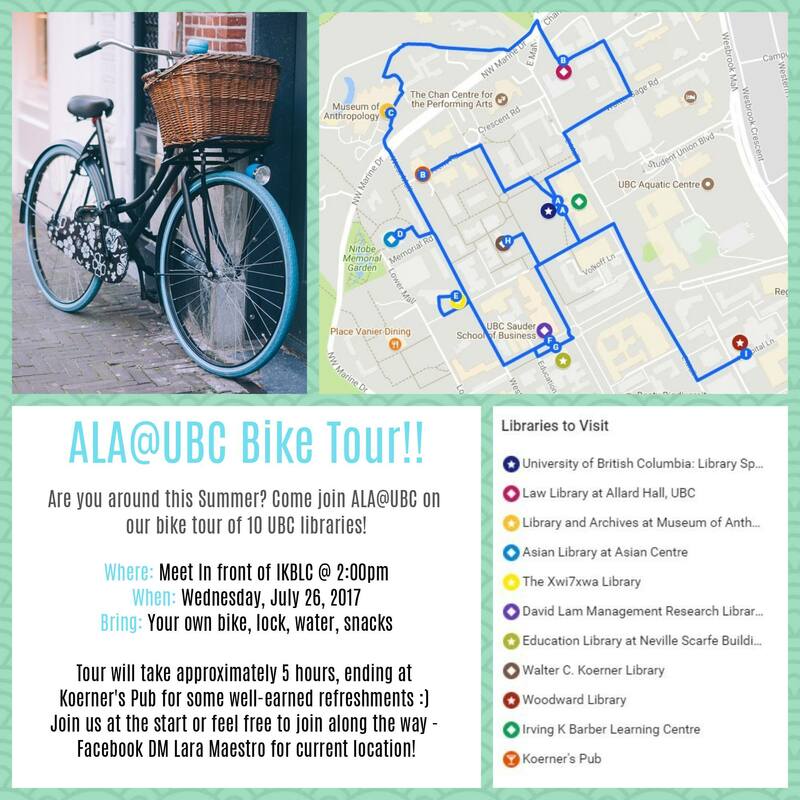 The ALA@UBC Twitter can be found here: https://twitter.com/ubcALA. We would also like an Events Coordinator who can do bookings and help to formally plan events. Also, we would like an ALA Student Club Outreach Coordinator, who would be responsible for interacting and communicating with other ALA Student clubs in Canada and the US. We have previously don exchanges with the University of Washington, and would like to do more. Feel free to email an executive member if you would like to express interest. We would like to do Social Events every month, especially ones with more academic themes. Due to the geographic proximity of the event, many have expressed interest in attending as a group. We could easily get preferential rates on a train journey with a group of over 20. Some executive members will be attending the Vancouver Public Libraries Grand Opening of the rooftop garden and upper floors on Saturday, September 29th at 10:00am. We would like to plan more visits like we have had in the past where we contact a special librarian and ask about having a private tour. If anyone would like to suggest somewhere to go, please do. What events could we work together on? Rachel McRory is taking on the role of Webmaster and will be acting Secretary unless other members express interest in the role of Secretary. Webmaster and Co-Chairs officially all have blog access. More information is needed about how this would work, what supplies/space are necessary, whether it is feasible to plan for the end of term. Erin will look into this. Suggestion of themed trivia night as alternate year-end activity. Interest in doing more with the resources that are available to/received by the ALA club email: want to pass more information about the ALA as an organization along to ALA club members. Interest in hosting an event or a skype session with people from the greater ALA community or people working in the profession. This is for the distant future, maybe an event we could try to plan for the start of the September term. Also noted that scholarships are due by March 15 for the JCLC conference: Lara will forward the information to ALA club members. Plan to schedule the next meeting in conjunction with the end-of-term event on Thursday of the last week of classes. Lisa Zhu and Erin Flynn are taking over as co-chairs. Lisa was given access to ALA email; Erin and Lisa were given access to the MailChimp account. Necessity of having an ALA membership discussed. Still need to find a new Webmaster and Secretary. Rachel McRory might be willing to be Webmaster – need to confirm her interest in the position. Overall, the scavenger hunt was a success. For next time, should establish the email address and Google form, and determine rules about needing to be present at the wrap-up party to receive prizes. ischoolhunt email address and google form will be left setup; might also want to reuse some of the difficult questions for next hunt. Maybe host a mid-term colouring night: will need to send out a poll to decide what movie to show. Need to ask Lucas about where last term’s colouring books are. Possible screening of Youth Media Awards: it runs at 8AM MST on February 12 but might want to watch it after the fact because of Family Day. Maybe bring in a professional or PHD candidate to give a talk or host a webcast. Possibly to talk about importance of ALA accreditation, what it means for students. Could ask someone from accreditation committee for last year. Will send out a doodle the week before the meeting to try to get more people to come. Lara introduced the ALA executive members and explained their roles. Lara explained the role of the American Library Association and the ways it connects students and professionals to the library/information profession. Joining the ALA was recommended. Student pricing and ALA member resources (roundtables, professional divisions, webinars, etc) were explained. Questions about becoming an ALA member were asked. Lara explained ALA membership is necessary for accessing roundtables but the professional divisions and ethnic caucuses often have their own memberships. It was clarified that you can get a membership online, but that ALA membership is not needed to be in the ALA Student Chapter. A discussion was had about ALA conferences and whether membership is required. The Student Chapter acts as a conduit for students to get information put out by the ALA (links and information are included in newsletters). It also helps connect students with the UBC SLAIS community through events and collaborations with other groups. Members were reminded that the Scavenger Hunt started today, but people are still welcome to sign up. There will be a scavenger hunt wrap up party on Friday, January 19 at Koerner’s. There was discussion of the other events the ALA normally hosts (coloring party last term, tour of aquarium library). Members were directed to the SLA for additional tours. Kellen explained the possible trip to Western Washington University Children’s Literature Conference. Lara recommended that members apply to the ALA scholarships and explained some of their requirements. It was clarified that students do not need to be ALA members to apply and that it is beneficial to have SLAIS faculty provide reference letters. Members were reminded of upcoming free webinars and directed to the newsletter for links. Lara nominated Lisa Zhu and Erin Flynn to be co-chairs. Kellen seconded the nomination. The secretary and webmaster positions are currently open. Meetings will be held on Mondays from 5-6 PM. The next meeting will be in approximately one month, date to be determined later. Welcome to the new school year at SLAIS! We are still looking for someone to take on the role of webmaster in Erin’s absence. Erin will be gone until January. The duties include e-mails, posting the meeting minutes, and control of social media accounts, including Twitter. The ALA’s first social event of the season, drinks downtown following a tour of the VPL central branch was a success! Many students from the new cohort joined us. Attendance was about 12 people. We hope to host another such event soon. YAACS has expressed interesting in collaborating with us to conduct a scavenger hunt or a library tour during October, before LASSA’s Halloween party. We are very much interested, but have tabled the issue at the moment. We have to communicate with them more soon to set up details. Tentative date could be set at October 17th around 10:30 a.m.
A reminder that scholarships offered by the ALA are on now and people are encouraged to apply! Anybody in an MLIS program can apply. Usually requirements involve a short essay and up to three references. Apply early! Applications can be found online. There are also scholarships for traveling to conferences. This year the ALA conference is in Chicago! A reminder that ALA membership is discounted for students, around $39 dollars, and has many perks! We are hoping to join the RBSC on a tour of the Canadian Health Library here in Vancouver. Exact date is to be decided. We are hoping to host more social events in the future, including a repeat of our successful tour of a special library, perhaps at a health library. We also want to have social events and board game nights, perhaps at Stormcrow. We may also talk more about a trip to Bellingham later on in the semester. Next meeting: Claire will host a doodle poll to decide. Lara is the new president! Lara and Lucas will talk to the new cohort on the orientation day about the available Treasurer position. Our faculty advisor is gone, Aaron Lorehlein, so we need to find a new one, in order to apply for our essays for funding. Lucas will ask Richard Arias-Hernandez. Claire will e-mail sign up sheet to Lara for the orientation, and Lara will bring her laptop for the new cohort to give us their e-mail addresses. There schedule is Tuesday 2-5, Wednesday 9-12/2-5, and Thursday 2-5. Could have a mixer as the first event. Perhaps at Library Square? We will finalize after the business of orientation. September 15th? Next meeting: September 21, Thursday, at 5:15. Closer to December: How to fill people leaving/coming back. Join us for an afternoon of library fun!